e-Construction means using technology to manage transportation programs more efficiently. It also means not having to carry around 20,000 pieces of paper. A Florida Department of Transportation project oversight engineer loaded information related to four projects—plans, manuals, specification books, standards—on a tablet computer “so he doesn’t have to carry around all that paper anymore,” said Amy Tootle, state construction final estimates engineer for the department. Tootle is one of several speakers who shared highway agency experiences with e-Construction—the collection, review, approval and distribution of construction documents in a paperless environment—at the fall 2014 Every Day Counts summits. Through EDC, the Federal Highway Administration is partnering with the American Association of State Highway and Transportation Officials Innovation Initiative to encourage adoption of e-Construction to enhance productivity and accelerate project delivery. Many state transportation departments are exploring aspects of e-Construction, while others are mainstreaming e-Construction practices. They’re finding it offers several benefits. The Florida DOT, one of several agencies using e-Construction on design-build projects, has invested in a collaborative sharing site, mobile devices, digital signatures and form automation to improve its processes. All of the stakeholders on a construction contract have access to the collaboration site, Tootle said. “We have workflows set up that will automatically alert people when there are signatures or approvals that need to be made,” she said. The agency’s initial investment in e-Construction was about $1.5 million, Tootle said, but it expects to save about $22 million a year on paper and overhead costs. The Iowa Department of Transportation piloted e-Construction on four 2014 projects, including a small bridge replacement, a hot-mix asphalt overlay job and two major interstate reconstruction contracts. Going paperless involved using electronic project plans, contracts, specification books, standards, construction manuals, contractor payments and as-built records. Using e-Construction yielded many benefits, said Greg Mulder, director of the Iowa DOT Office of Construction and Materials, such as reduced costs, immediate document distribution with no time or money spent on printing or mailing, and faster and more accurate contractor payments. Documents are secure but readily available for project partners to view on a variety of devices. The Michigan Department of Transportation, an e-Construction leader, piloted its system in 2013 on four projects worth about $130 million. In 2014, the department used it on a $160 million project to rebuild part of I-96 in Detroit, as well as on at least one project in each field office. In 2015, the agency is instituting the program on virtually all projects. Each year, the Michigan DOT saves an estimated $12 million through increased efficiency and six million sheets of paper by using electronic document storage for its $1 billion construction program, while reducing its average contract modification processing time from 30 to three days. 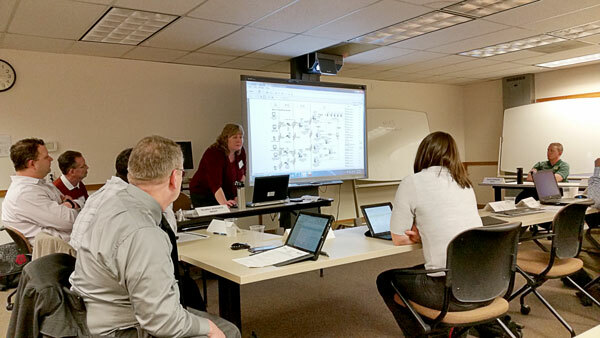 During a spring peer exchange, the Oregon DOT got advice on pursuing a paperless approach to construction contract administration from the Michigan DOT. FHWA offers technical support and training to help the highway community adopt e-Construction, said Bryan Cawley, FHWA Construction Management Team leader and head of the EDC-3 e-Construction Team. The team can assist with peer exchanges so agencies learn from the experience of states already using e-Construction. During March exchanges, Oregon Department of Transportation staff got advice on system requirements, workflow processes and staffing from the Michigan DOT, while Delaware Department of Transportation staff met with colleagues at the Texas Department of Transportation. Both the Oregon and Delaware agencies plan to use e-Construction on pilot projects in 2015 and expand their programs statewide in 2016. A recording of the EDC-3 summit session outlines e-Construction practices and shares agency successes. The AASHTO Innovation Initiative e-Construction page has additional resources. Transportation innovations are thriving in Colorado, thanks to the recent formation of the Colorado State Transportation Innovation Council. Like similar groups in other states, the Colorado STIC works to foster a collaborative culture, advocate for innovation and explore ways to deploy new ideas in transportation. “We are striving to be a catalyst in rapidly implementing innovative tools and techniques for transportation stakeholders,” said Gary Vansuch, director of process improvement for the Colorado Department of Transportation and secretary of the state STIC. A brine-making system developed by Colorado DOT maintenance staff produces 24,000 gallons of salt brine deicer in just four hours. Recycled waste water from the maintenance patrol barn floor drains is filtered for contaminants and mixed into the brine. Founded in 2014, the Colorado STIC is led by Josh Laipply, the Colorado DOT’s chief engineer, and Alicia Nolan, assistant administrator of the Federal Highway Administration’s Colorado Division. Members include representatives of the American Public Works Association, Colorado Local Technical Assistance Program, American Council of Engineering Companies and Colorado Contractors Association. Through the STIC Incentive program, FHWA provides STICs like Colorado’s with up to $100,000 a year to defray the cost of standardizing innovative practices. A state transportation agency or other public sector transportation stakeholder can submit proposals to receive some of that money to foster innovation. Last year, the Colorado STIC received proposals from the Colorado DOT, city governments and even the U.S. Forest Service. “If a school district wanted to apply for transportation-related innovations, or a tribal government wanted to propose something, or any public sector organization, they certainly could,” said Vansuch. The Denver suburb of Centennial, for example, was awarded $30,000 for a proposal to cooperate with neighboring suburbs to improve the interoperability of intelligent transportation systems. The money will help improve the partnering process among area cities and towns. “That process includes how you get people together and how you make decisions across different political entities when several different cities are involved,” said Vansuch. 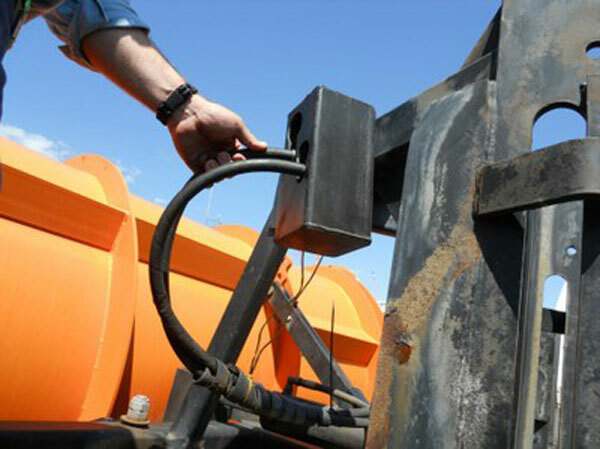 A box made to hold hydraulic hoses reduces fluid spills when staff are working on equipment. It has been replicated more than 280 times across Colorado DOT maintenance patrols. “They have ITS components already,” said Nolan. “What they’re striving to do is to make sure there is interoperability with other systems in the same area. Centennial’s effort is to see how best to integrate the ITS technology and make sure that it is a seamless way to manage traffic.” Besides Centennial, cooperating entities include Arapahoe County, the city of Aurora, the city of Parker and Greenwood Village. Two other Colorado DOT proposals won 2014 STIC awards. One focused on promoting Lean Everyday Ideas, an effort to spread innovative methods and processes throughout the state’s transportation community, including local agencies. The other developed a training program on fast-growing vegetation that will help mitigate the effects of natural disasters and harsh winters on land made barren by construction projects. Outreach and education are key ways the Pennsylvania State Transportation Innovation Council supports innovation. Accomplishments 2014: Innovation Through Collaboration outlines what the STIC did last year: trained more than 500 Pennsylvania Department of Transportation employees, approved 15 new initiatives and promoted the deployment of a number of other innovations through presentations at events across the state. Adaptive signal control technology is being installed on important travel corridors throughout the state, including U.S. 22 and the Carlisle Pike. Geosynthetic reinforced soil-integrated bridge system technology has been used to build 10 bridges in the state. Innovative intersection and interchange geometric designs are being built throughout the state, with the first diverging diamond interchange planned for the intersection of I-70 and U.S. Route 19 in Washington County. The STIC’s Innovations Catalog offers step-by-step instructions on moving an innovation from idea to deployment. It provides details on innovations the state is using, including the benefits and deployment status of each. The results are in: High-friction surface treatments are cutting crashes at what used to be safety trouble spots, according to follow-up evaluations of installations across the country. High-friction surface treatments are pavement overlay systems with exceptional skid resistance not typically provided by conventional paving materials. They involve applying polish-resistant, durable aggregates with a polymer binder to provide motorists with better traction at high-crash locations, such as horizontal curves, intersection approaches, upgrades and downgrades. The Federal Highway Administration highlighted the technology in the second round of Every Day Counts to encourage highway agencies to mainstream it as a safety countermeasure at spot locations. By the beginning of 2015, 37 states, Washington, D.C., and Puerto Rico were using high-friction surface treatments, up from 14 two years earlier. Five states have made the treatments a standard practice. High-friction surface treatments help motorists maintain better control in dry and wet driving conditions, reducing crashes, injuries and fatalities. They’re relatively low in cost compared to geometric roadway improvements. And they can be installed quickly with minimal impact on traffic and negligible effect on the environment. The Missouri Department of Transportation received a Highways for LIFE grant from FHWA to demonstrate the use of high-friction surface treatment on four projects in 2013 and 2014, two in Phelps County on I-44 and two in Cole County on U.S. 54 and Missouri 179. The locations had a history of wet-weather crashes. Applying a high-friction surface treatment cost more than a traditional pavement wearing surface, but an evaluation showed that it significantly improved friction at the four locations. In the first year after the U.S. 54 project, crashes dropped from an annual average of 32 to just five. That resulted in a crash cost savings of $966,300, nearly twice the additional cost of high-friction surface treatment placement at all four locations combined. In 2012, the Pennsylvania Department of Transportation applied a high-friction surface treatment to a curve in Wilson Borough. The site was chosen because of its history of wet-weather crashes—26 over a three-year period. Since the treatment was installed, just one crash has been reported. FHWA collaborated with the Wisconsin Department of Transportation on a 2011 demonstration project to use a high-friction surface treatment on the Marquette interchange ramp from I-94 to I-43 in Milwaukee. In the past, vehicles had left the roadway so frequently during wet weather that the ramp often had to be shut down. In the three years after a high-friction surface treatment was applied, nine crashes occurred—a huge drop from the 219 crashes during the three years before installation. The Kentucky Transportation Cabinet has installed high-friction surface treatments at 94 locations since 2010. In 2013, the agency conducted a crash analysis of 43 applications on ramps and horizontal curves from 2009 to 2012. For horizontal curve installations, yearly wet-weather crash averages declined 86 percent, dry-weather crash averages dropped 47 percent and total crashes fell 73 percent. For ramp installations, wet-weather crash averages declined 85 percent, dry-weather crash averages were down 66 percent and total crashes were 78 percent lower. Application of a high-friction surface treatment has improved safety at a Missouri site with a history of wet-weather crashes. The North Carolina Department of Transportation applied a high-friction surface treatment in 2009 on an I-85 on-ramp from North Carolina Route 7 in Gaston County, where lane-departure crashes were a problem, particularly during wet weather. An evaluation five years later found that the treatment had significantly reduced both the frequency and severity of crashes. Total crashes declined 78 percent—from 50 during the five-year period before the treatment was installed to 11 after—and the severity of the few remaining crashes was reduced by half. 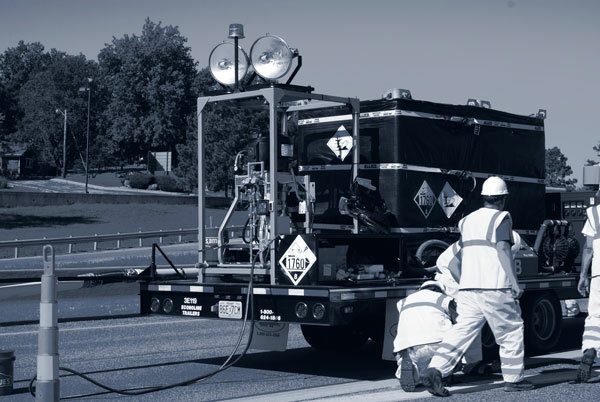 The South Carolina Department of Transportation used a high-friction surface treatment in 2008 on a stretch of U.S. 25 in Greenville County that experienced high crash rates, especially during inclement weather. A significant contributor to the crash problem was a concrete barrier that channeled water to the driving lane, but replacing the barrier would have cost $5 million and taken three years. Speeding and sight distance constraints added to the location’s safety issues. The six-month high-friction surface treatment project cost $1 million, 80 percent less than the reconstruction project’s price tag. A before-and-after study showed a 68 percent reduction in wet-weather crashes and a 56 percent drop in total crashes. While they sound like alphabet soup, IQED and eNEPA are useful tools for enhancing collaboration on and shortening the time needed for transportation project approvals under the National Environmental Policy Act. Implementing quality environmental documentation, or IQED, is an effort to promote best practices for simplifying and expediting the development of NEPA documents for construction projects. It focuses on core principles for creating effective documents: tell the project story, keep the document brief and ensure that it meets legal requirements. Video: Watch a recording of the EDC-3 fall 2014 summit session on improving collaboration and quality environmental documentation to learn more about the benefits of IQED and eNEPA. After encouraging the adoption of IQED principles during the second round of Every Day Counts, the Federal Highway Administration is continuing the effort in EDC-3 to help more transportation agencies improve the quality and reduce the size of NEPA documents while saving time and money. The EDC-3 effort to improve collaboration and quality environmental documentation builds on EDC-2 by incorporating eNEPA, an online workflow tool FHWA created for transportation projects that require an environmental impact statement or environmental assessment. The eNEPA tool helps agencies transition to an electronic review process that can be done concurrently with more effective interagency dialogue. 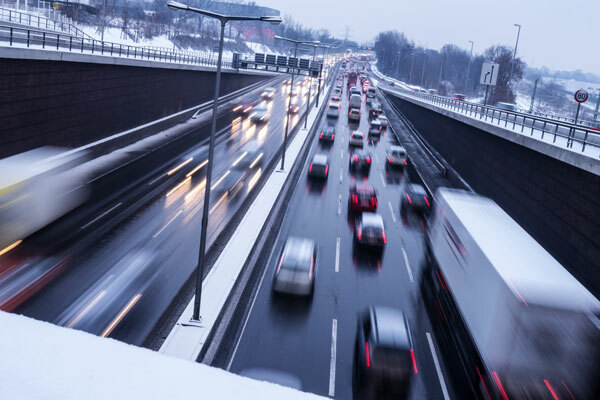 Several state highway agencies and other agencies, including the Federal Transit Administration and Federal Railroad Administration, have piloted eNEPA on projects. Enhanced efficiency—IQED and eNEPA can help ensure that the product of the NEPA review process is improved and delivered in less time. Using eNEPA allows concurrent document reviews by multiple agencies and resolution of issues at the draft stage, resulting in faster project development. Better outcomes—Collaboration produces higher-quality documents and a stronger administrative record, which can improve environmental outcomes. The enhanced program-level data can be used to identify future opportunities for process improvements and programmatic agreements. FHWA’s eNEPA is a web-based interagency collaboration and development tool for transportation projects that need environmental impact statements or environmental assessments. Share documents and comments faster. Provide real-time schedule status and tracking. Obtain quick, clear and transparent issue resolution. Reduce paper, printing and mailing costs. Two new publications report on the progress of Every Day Counts, the Federal Highway Administration’s initiative to advance an innovative culture in the transportation community. Every Day Counts: Creating Efficiency Through Technology and Collaboration describes the 11 innovations FHWA is promoting in the third round of EDC. It summarizes their deployment status at the beginning of 2015 and the goals set to broaden adoption by the end of 2016. Every Day Counts: Building a Culture of Innovation for the 21st Century documents the results of EDC’s second round, which involved implementation of 13 technologies and practices in 2013 and 2014. The report details how the innovations are improving the transportation system. Underwater pile-driving is loud and today’s noise-attenuation methods don’t work very well. But a new technology developed by the University of Washington shows potential for reducing noise on construction projects like bridges and ferry docks supported by piles, driven into the floor of an ocean, lake or river by large impact hammers. That can decrease the harm to fish, birds and marine mammals. 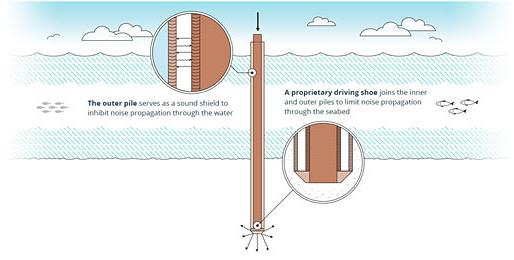 With standard pile construction, the clamor created by hammering the piles carries easily underwater and can injure—even kill—sensitive wildlife. Pile-driving projects are often required to use sound-minimizing measures to protect wildlife, such as those listed under the Endangered Species Act, in the project vicinity. Existing methods—bubble curtains, cofferdams and isolation casings—can have limited effectiveness. They also can be cumbersome to install, delaying construction and increasing costs. In 2008, the Washington State Department of Transportation invited the construction industry and academia to come up with a quieter solution. The winning proposal came from the University of Washington, which led to development of a double-wall pile that lowers the volume about 20 decibels, below the harm threshold for most endangered species. In this pile-within-a-pile design, the hammer strikes the inner pipe while the outer pipe helps shield the sound waves. The University of Washington, with support from the Washington State DOT and the Federal Highway Administration, conducted a full-scale test of the double-wall pile design in Puget Sound in October 2014. Test results showed that the new design achieved a 21- to 23-decibel noise reduction over the standard pile, compared to a 3- to 6-decibel reduction for the pile with a bubble curtain. The results were consistent with previous laboratory tests and computer modeling on the double-wall design. The University of Washington and the Washington State DOT presented the test results during a February 2015 symposium, which drew an international audience. Among the implications of the new technology speakers discussed are its potential to make construction in marine environments safer for wildlife by reducing noise. Double-wall piles also could cut a project’s price tag by speeding up construction and lowering the cost of environmental monitoring and mitigation. More evaluation of the new design is planned for this summer, when double-wall piles will be tested on a ferry terminal construction project on Vashon Island near Tacoma, Washington. The Sacaton Bridge replacement project at the Gila River Indian Community near Phoenix was the first in Arizona to use the bridge slide technique, as well as the first for a tribal nation in the United States. More than 100 people came to a showcase to learn about the construction manager/general contractor project and watch workers slide a prefabricated bridge segment into place with hydraulic jacks. Because it involved a road closure of just nine days, the bridge slide saved drivers four to six months of detour delays, cutting road user costs by $900,000 to $1.4 million. The Gila River Indian Community received a second Strategic Highway Research Program award to use accelerated bridge construction on the project. The state of Delaware has completed a geospatial data collaboration-related project called FirstMap, an online geographic information system tool. It consists of a database and infrastructure to support geospatial and image services. It’s designed to support the GIS needs of Delaware’s state agencies, counties, municipalities, universities and the public. The Delaware Department of Transportation was a partner in creating FirstMap, which is maintained by the Delaware Department of Technology and Information. Firms working on the design of the Manning Crevice Bridge replacement in Idaho are using 3D engineered models to facilitate project delivery. The firm designing the project developed a 3D model of the bridge, then worked with the construction manager/general contractor to develop a time-lapse 3D, or 4D, model that shows the construction sequencing. Replacing the 1930s-era suspension bridge over the Salmon River is a cooperative effort of Idaho County, Federal Lands Highway and the U.S. Forest Service. 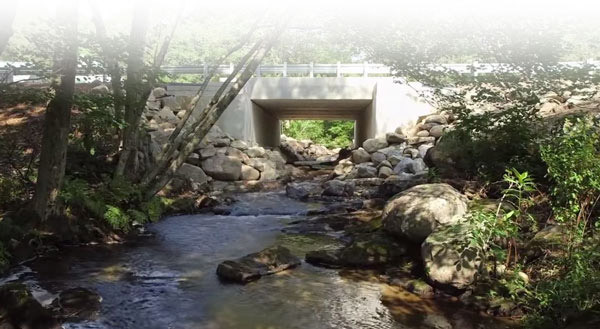 A Maine Audubon video features geosynthetic reinforced soil-integrated bridge system technology as a positive environmental option for stream crossings. The video uses a 2013 culvert replacement project in Bremen as an example. The Maine Department of Transportation chose GRS-IBS for the project to provide a wider passage for fish than the original culvert. Also, the reduced construction time needed for GRS-IBS compared to a traditional bridge minimized stream disturbance and the impact on protected resources in the area.